"The Spirit of Albion" began life as a play devised by the Archway Theatre Young Adults Workshop. The Archway Theatre is based in Horley, Surrey and the Young Adults Workshop is made up of 16 to 21 year old members of the theatre. Every summer,we put on a show - usually a devised piece. In September 2009 we decided that the summer 2010 production would be a musical and the music chosen was by Damh the Bard. 10 songs were picked out and the story and characters were created based on them. The show was performed for 3 nights in early July. 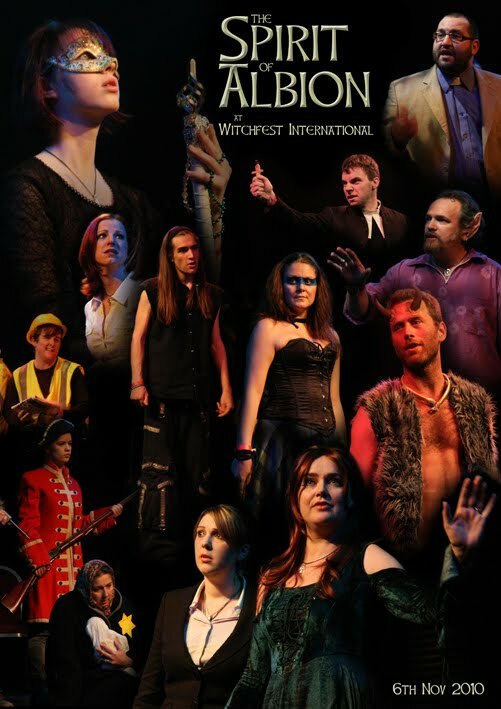 In a packed auditorium, I sat among the audience waiting to see how the show would use the songs of Damh the Bard to tell it's own tale of magick and mystery. For two enjoyable hours I was drawn in by the story, losing myself entirely to it's woodland setting and the unfolding drama. So enwrapped in the adventure was I, that I almost forgot I was actually a member of an audience! Each one of us had been captivated the same way, with only our shared laughter and tears reminding us of others around us. As the story came to it's conclusion, I felt refreshed and invigorated...as did everyone in the theatre. Every voice sang along to the final song, and from the smiles from audience and cast alike, it's clear to see that SOA is something very special indeed....not only a show to watch, but also a story to be a part of.